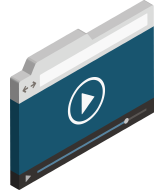 This demo is built using our PRESTOplay cross-browser video player SDK. It includes features such as DRM support in HTML5 with Common Encryption (CENC) on modern browsers, and Silverlight® with PlayReady® as a fallback for older browsers. The player will automatically select the best technology available based on your browser's capabilities, ensuring playback compatibility across the greatest range of browsers. DRM licensing for our demo is provided through our cloud multi-DRM service, DRMtoday. DRMtoday provides a single source for licensing all DRM systems used across browsers, including: Google Widevine™, Microsoft® PlayReady, and FairPlay Streaming by Apple. Speak with our team at sales@castlabs.com for more information about our PRESTOplay SDK suite and DRMtoday service. castLabs is not responsible for the security technology used by browsers, nor vulnerabilities present within a browser application. Apple and FairPlay are trademarks of Apple Inc. PlayReady and Silverlight are registered trademarks of Microsoft Corporation in the United States and other countries. Google is a registered trademark of Google Inc.